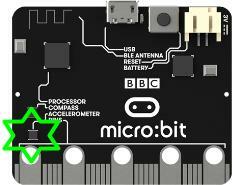 The accelerometer on a BBC micro:bit measures acceleration, as its name suggests. The accelerometer can measure accelerations of between +2g to -2g. X - tilting from left to right. Y - tilting forwards and backwards. Z - moving up and down. The measurement for each axis is a positive or negative number indicating a value in milli-g’s. When the reading is 0 you are “level” along that particular axis. 1024 milli-g is the acceleration due to gravity. Upload this and open the serial monitor. Hold the micro:bit flat with the LEDs uppermost. You should see that the X and Y accelerations are near to zero, and the Z acceleration is close to -1024. This tells you that gravity is acting downwards relative to the micro:bit. Flip the board over so the LEDs are nearest the floor. The Z value should become positive at +1024 milli-g. If you shake the micro:bit vigorously enough, you’ll see that the accelerations go up to ±2048 milli-g. That’s because this accelerometer is set to measure a maximum of ±2048 milli-g: the true number might be higher than that. If you’ve ever wondered how a mobile phone knows which up to show the images on its screen, it’s because it uses an accelerometer in exactly the same way as the program above. Game controllers also contain accelerometers to help you steer and move around in games. The really interesting side-effect of having an accelerometer is gesture detection. If you move your BBC micro:bit in a certain way (as a gesture) then MicroPython is able to detect this. MicroPython is able to recognise the following gestures: up, down, left, right, face up, face down, freefall, 3g, 6g, 8g, shake. Gestures are always represented as strings. While most of the names should be obvious, the 3g, 6g and 8g gestures apply when the device encounters these levels of g-force (like when an astronaut is launched into space). Once again, because we want the device to react to changing circumstances we use a while loop. Within the scope of the loop the current gesture is read and put into gesture. The if conditional checks if gesture is equal to "face up" (Python uses == to test for equality, a single equals sign = is used for assignment - just like how we assign the gesture reading to the gesture object). If the gesture is equal to "face up" then use the display to show a happy face. Otherwise, the device is made to look angry! Now if you keep the the accelerometer still (put it on the desk), this will give an acceleration of about 1g, irrespective of what orientation you have the BBC micro:bit in – and it will be different to that as you move it about. Actually, the value will vary slightly even if you keep it still, because the accelerometer isn’t a perfect measuring device. Dealing with this is a process called calibration and is something we have to do when we need to know a quantity accurately. Using the BBC micro:bit music library, play a note based on the the reading from the accelerometer. Hint: set the pitch to the value of the accelerometer measurement. Display the characters ‘L’ or ‘R’ depending on whether the BBC micro:bit is tilted to the left or the right. Make the LEDs light up when the magnitude of the acceleration is greater than 1024 milli-gs. Shake the micro:bit to make the LEDs light up. Make a dice, hint: use one of the Python random functions. Type import random at the top of your program and use random.randrange(start, stop). This will generate a random number between start and stop - 1. © Copyright 2016-2016. Revision ccb332ee.